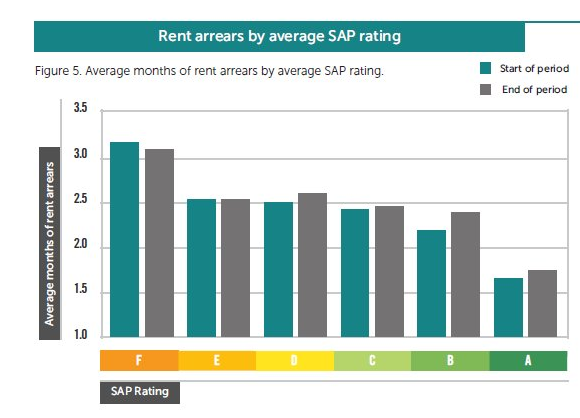 Rent arrears are on average half a month higher in band ‘F’ properties than in other bands. Other cost savings identified include time spent seeking overdue rent payment, legal costs and court costs which decline by around 35% for more energy efficient homes. In fact the table below was tweeted today by Sustainable Homes and it showing that the poorest performing homes will ultimately cost landlords more money in rent arrears. As you will know Elmhurst has long campaigned for warmer homes, which we know cost less to run for the tenant and thereby enable social and economic benefits to not only the landlord and the tenant – but to the wider economy as well. We welcome the research, and also advocate that those private landlords affected by Minimum Energy Efficiency Standards (MEES), which attempt to lift the poorest performing properties out of F and G ratings, read the report and understand that the economic benefits of making homes warmer will help not only help the tenants, but also themselves and their businesses.